A monumental-sized building on Old Street in the City of London, St Luke’s Hospital for Lunatics was founded in 1751 to treat the poor who suffered from mental illnesses. 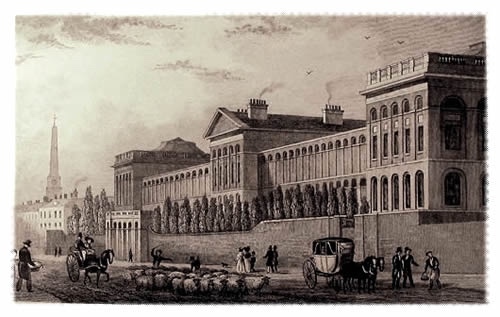 The new hospital – which was built partly through concerns about abuses patients suffered at the more famous Royal Bethlehem Hospital (Bedlam) – was initially located on a site in Moorfields which had been formerly occupied by a foundry. But in 1786 it moved to the purpose-built palatial premises in Old Street where it remained until 1916. The new building, which was designed by George Dance after an competition for its design apparently failed to find a suitable candidate, had a 150 metre long street frontage with a central entrance and male wards on one side and female wards on the other. The building contained some 300 individual cells – each had a small window, but no heating. There were gardens located behind it and in the basement were cold water baths used to treat patients. The hospital building was enlarged in the 1840s when infirmaries and a chapel were added. By the 1860s, the hospital appears to have abandoned its target market of the poor – the 150 or so patients were then described as being of “middle class”. In 1916, the patients were transferred to other institutions – the charity running the hospital set up a ward in Middlesex Hospital – or sent home and the buildings were acquired by the Bank of England. The premises was used to print banknotes until the 1950s and the building, which had been damaged during World War I, was eventually demolished in 1963. The archive of St Luke’s have been digitised and are held by the Wellcome Library.